Greetings, fellow git venturers, and welcome to part two of our guide to git, the version control software, and GitHub — the git-driven center of the open source universe where millions of developers store their projects. In part one we discussed git and how to get started using it. Git is a truly remarkable tool: while actually quite complex, beginners can start using git’s most important functions right away without needing to know much at all, beyond the basic operations we introduced last time. At this point you know the fundamentals of the git-centric workflow and how to conduct basic version control: creating a repository, staging and committing changes. The next step is to deploy your project to GitHub. 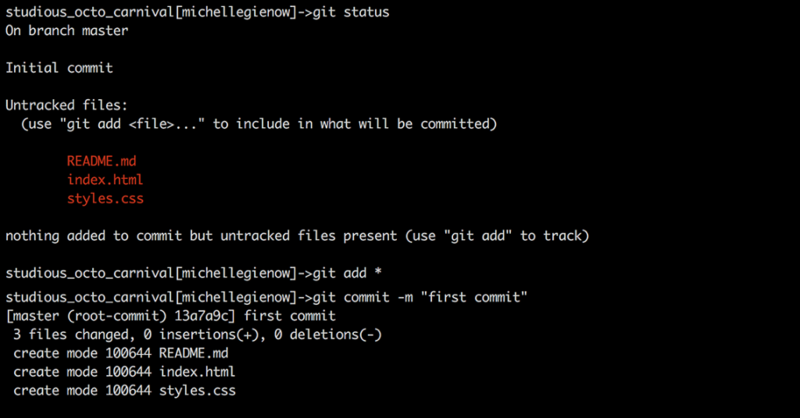 Git itself is a command-line tool, and lives in your laptop. 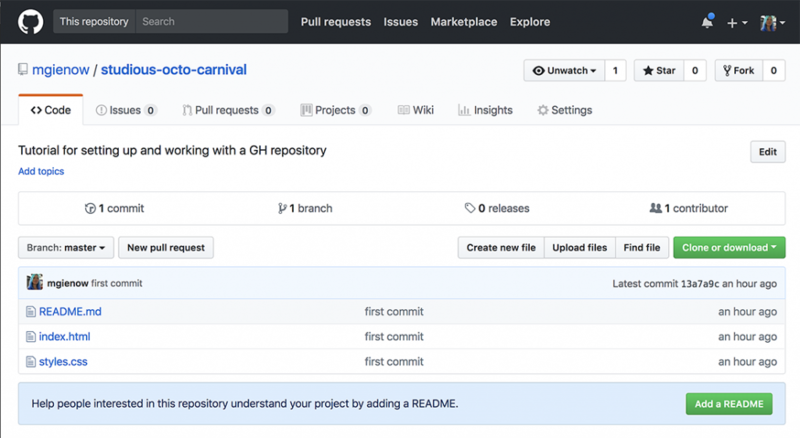 The center around which all things git — init projects revolve, however, is the literal hub — GitHub.com — where developers upload and store their projects, and where other people can view and contribute to them. I will let you in on a dirty little secret of the tech world: many developers are not all that great with GitHub. “Git” via the webcomic xkcd. Used with permission. This commonly shared shame directly conflicts with another not-so-secret secret: these days, a developer’s true resume is not some piece of paper listing previous experience — it’s your GitHub page. Prospective employers go straight to your page to see the kind of projects you’ve done, your commit histories, and even open up repositories to look at your actual code. It’s kind of like being naked, in a professional sense. (Actually, for a coder, this is exactly like being naked). Where these two data points intersect: as a developer in the modern web environment, it is imperative to understand the workflow that drives git and GitHub. In other words, how the systems works and why we perform each step of it. Once you’ve internalized that understanding, the how actually becomes pretty easy — self-explanatory, even. Let’s start by setting up an account on GitHub. It’s simple enough: establish a username and the email you wish to have linked with your GitHub existence. Pro tip 1: take a minute to think about your username. This is going to be inextricably linked with your professional identity forever, so some combination of your first and last name is likely your best bet. (Which can be a small ”that username already exists” error message problem if you have a commonly-occurring set of monikers, but we trust you can figure something out). Pro tip 2: every conceivable username combination of “foo” and “bar” has already been taken. 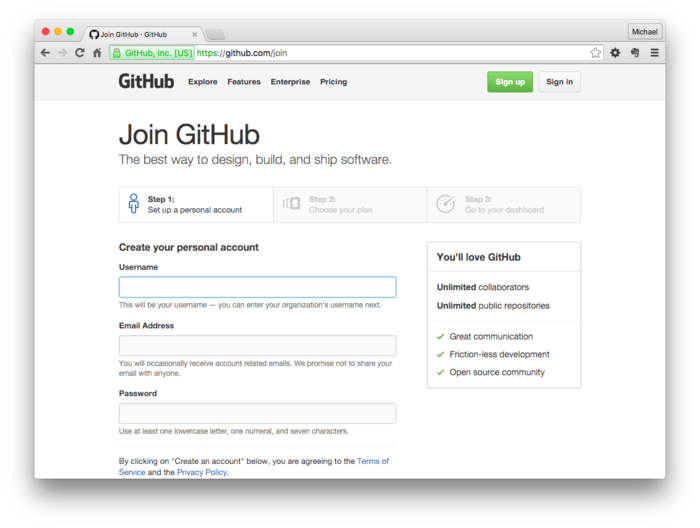 It is completely free to create and use a GitHub account. Let us all pause for a moment of gratitude that this amazing resource exists in the first place, and that it doesn’t cost individual devs a dime. From here on out we are going to be using my own GitHub page as an example. Obviously, as you follow along, change anything that says “mgienow” — my first initial/last name GitHub handle (because “blue-haired JS goddess” seemed too braggy) — to your own GitHub handle. A final tip: at this point, every time you access GitHub from the command line — to push (upload) or pull (download) project files — it is going to ask for your GitHub password. There is a way to tell git to automatically authenticate with your password so you don’t need to enter it each time. The process varies a great deal depending on your OS, so go to the GitHub password caching guide and follow the instructions tailored to your particular scenario. This brings up a popup box; click on “new repository” (and don’t worry about the other options for now). GitHub then generates the page for you to create a new repo. GitHub detects your OS to responsively render its user interface, my screenshots may not match your results exactly if you’re on a different version of MacOS, or Windows or Linux. No worries: the boxes all fill in the same way. Description: For today, “Tutorial for setting up and working with a GitHub repository.” Next time, once the training wheels are off, type whatever it is your actual project does. Public vs Private: “Public” is the only option for a free GitHub account. Anyone with your GitHub address will be able to view whatever you upload — that’s why this is open source. If you need your privacy, paid GitHub accounts allow you to make private repositories as well. The current price is $7/per month for an individual developer plan. Initialize: The “initialize” step is up to you. 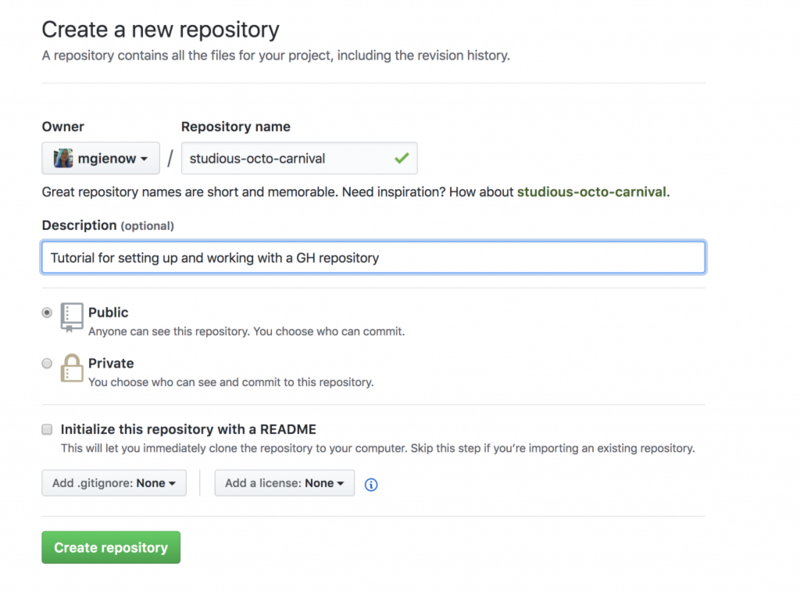 In our first git tutorial, we created a local README file as part of our project. Since we are going to be pushing a project up to GitHub, we do not want to create a new README. At this stage of the game, we don’t need to worry about “.gitignore” — though that will come in handy eventually, it’s beyond our current scope in terms of both need and ability — and same with licensing. Most beginners start by creating a project on their own computer and then uploading the whole enchilada to GitHub. You can also start by creating the GitHub repository first, pulling it down to your computer, and backfilling with content. It’s the same result either way, but the “first creation, then publication” model is the one most people naturally follow so that is what we are doing here. Let’s step through the entire process with a new example project since it’s important to internalize the git — and GitHub — workflow. 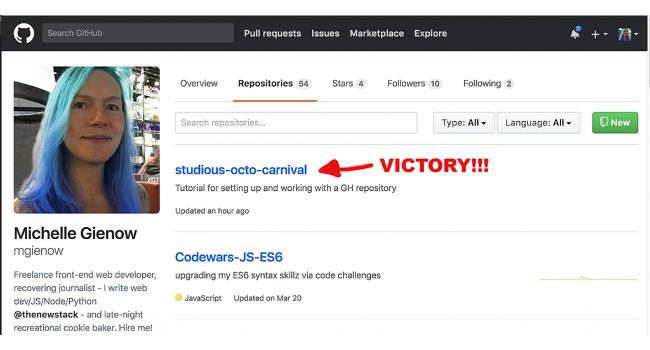 Referring back to the first tutorial, use the command line to create a project directory (folder) named “studious-octo-carnival” (remember: subbing in whatever random name GitHub suggested when you created your own repository in our previous step). CD into the new directory (<- this is important, and a step beginners often forget!) and create three new empty files, replicating a basic web page project structure: README.md, index.html, styles.css. So, workflow-wise, what we have done here is created a project folder, places several files in it, and then “turned on” version control using git-init. Stage the project: “git add *” takes a snapshot of your project directory and everything in it exactly how it is at this time. Commit the project: “git commit -m “First commit”” tells git to save this “snapshot” and the commit message as caption information. This is the magic moment: we are going to connect what you made locally with your GitHub repository. From now on you will be able to move content back and forth to your heart’s, well, content! We are going to push our existing, just-created repository from the command line. The easiest way to do this is to simply click the clipboard icon on the right (in the second box, “…or, upload a new repository from the command line”) and then paste that into terminal. However, I highly recommend typing everything in for now — it builds those git muscle memories, and also helps us keep track of what we are doing and why. 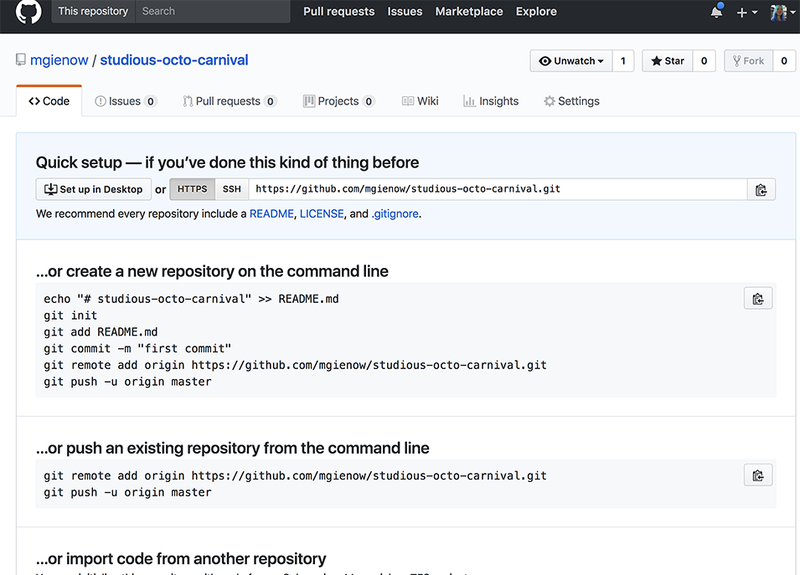 Add the remote: “Git remote add origin https://github.com/mgienow/studious-octo-carnival.git” tells git on your machine to add this link to your project. Let’s break down the link: GitHub.com is the host, and you’re putting it in your personal GitHub account so next comes your GitHub handle. Finally, the name of your project with a “.git” extension because it’s now a git file — an envelope holding everything packed inside your project, created back when you did “git init”. Don’t worry if you don’t see it — you don’t need to, and git’s got your back. Now push! “git push -u origin master” is the command to actually send your project to the remote. “Push” is the git term for uploading it. “-u” means upstream: your project is flowing upward to the host repository. “Master” refers to the master copy now live in your GitHub repo online. Second, you can check by typing “git status”. When you see the beautiful words, “On branch Master. Your branch is up to date with ‘origin/master.’ Nothing to commit, working tree clean” that means you are home free. CLEAN, baby! Whoo. I still get a little bit of a rush every time I successfully push code to GitHub. 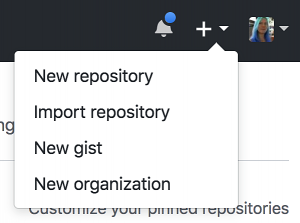 But the true evidence of victory lies on your GitHub account: the repository now shows up on your GitHub Repositories page. 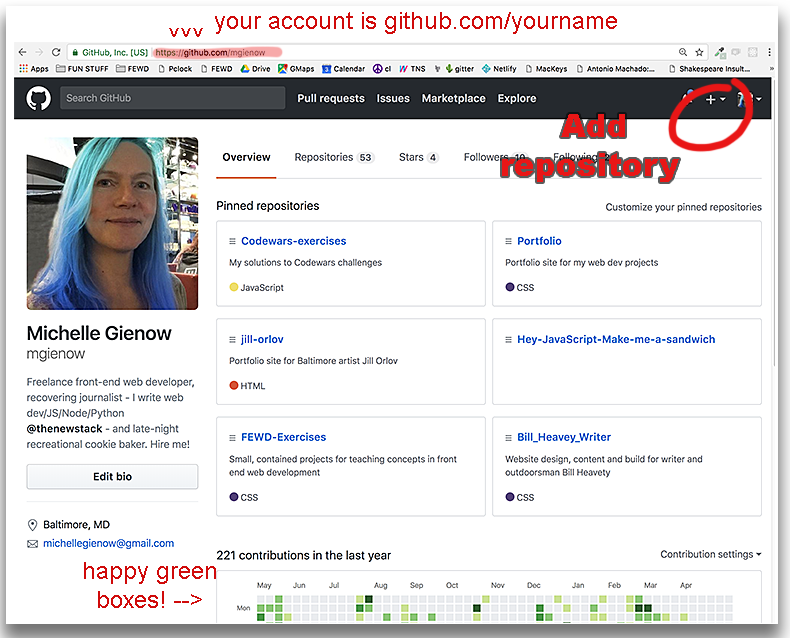 Notice the tabs on the top line next to your avatar image: Overview is your homepage, Repositories is where all your repos are listed in chronological order of most recently added/worked on. We created a GitHub account and thus made a giant leap into establishing an identity as a professional developer. We created a new project repository on GitHub. We created a sample project on our computer, initialized it as a git entity, staged and committed it, and pushed it to GitHub. Feel good? Great. Now go do it five more times. I’m serious: this is the heart of git workflow. Create -> stage -> commit -> push. You need to be absolutely comfortable with all these steps before moving on to any other GitHub endeavors. We will be back next week to talk about why origin is called origin, why master is called master, what truly lies upstream, branching, forking…all the mysteries of git revealed. Now shoo and go do your homework. Seriously. Make some new files in our sample project and push those. Then start a second sample project and practice making a new repo for it before pushing your first commit. Git going. Git good.